PalmCast Live is back on tonight at 8pm Eastern. We're twitching to bring on a special guest, but hey, in these trying times you never know what will work out. You'll have to tune to to see if Dieter, Derek, and Keith have Rod Whitby of WebOS Internals on the line to talk up the latest in webOS patches and hackery or if he's heading to the outback for some R&R. 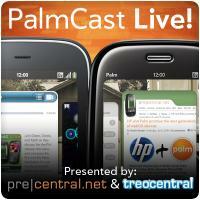 Twitterers, tweet it up with the #palmcast hashtag and we just might talk about your topic in the lightning round. The action happens right here, so come on in.